From emergency responders to law enforcement, many top professionals trust Belleville. 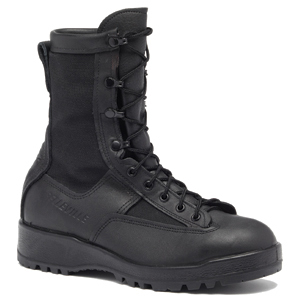 The Belleville 700 Waterproof Duty & Military Boot is the best selling black duty boot in the lineup. It features a top quality upper made from 100% pure cowhide leather and high abrasion nylon for extreme durability. This boot is completely waterproof and features a Gore-Tex liner that encases your foot with waterproof protection yet allows breathability. Belleville's patented VANGUARD running sole construction provides a running shoe fit and comfort for a familiar feel you are used to with athletic shoes. The 700 sports a premium quality polyurethane midsole for the ultimate in shock absorption without the memory and compression associated with cheaper EVA midsoles. This boot is designed to give you years of reliable performance whatever your duty requires. It is also Berry Amendment Compliant and proudly made in the USA at their world class manufacturing facility in Belleville, Illinois. When I was in the Navy over 15 years ago, the boots sucked. They were clumsy, uncomfortable, required a long break in time to soften the leather, and they were heavy. My worn out Navy flight boots needed replacing so I decided to try these Belleville 700s. I never imagined boots could be so comfortable right out of the box. No aftermarket insole was needed. I compare them to a heavier set of Reebok tennis shoes. They did run a bit large. I will never buy a different brand of boots again. Don't Settle For Made in China. Buy Belleville! My first pair went 3 years and the only reason I bought another pair is the heel part of the sole isn't flat any more and is showing wear. Apparently they are re-soleable but I decided to buy a second pair and keep my first for backup. Really an excellent pair of boot. I'm not one to write reviews but these boots really deserve it and people should know quality products like this still exist. Great set of boots but make sure you order half a size lower than what you normally wear. I'm a 9W in Bates and Wellco and I had to change these out for a 8.5W. Other than that, solid boots. Comfortable and durable. I now see why this is the official issue boot of the U.S. Navy. I'm 6'2", about 220 pounds, and work long shifts on work and concrete sites in commercial construction. I bought these on the advice of a friend and I can tell you that you wont find a better boots on the market for the money. These boots fit true to size and required very little break in. By lunchtime the first day, they felt like an old pair of sneakers. If you replace the insole with a quality aftermarket insole, you'll be good for 12 hours+ having these on. I really can't say enough good things about these boots. They save my feet everyday. These boots fit well and they are the right size the first time around. I ordered my regular size. Awesome pair of boots. It really doesn't get more comfortable than these. My feet stay dry and warm even in rain. My feet love being in these boots. You won't regret buying them. These Belleville 700s are nicely constructed of quality leather. They polish up easily and insulate well in cold weather. Great pair of boots so far. They do run somewhat larger than the stamped size. I bought these for the winter months and plan to buy the warmer weather equivalent in the spring. Love these boots. They were a gift from my son in law who works for the Oklahoma state prisons. I do a lot of work outside and these boots keep my feet dry and warm no matter the weather. I walk through puddles and my feet stay bone dry. Ankle movement is good for when you need to kneel down. Good boot. I recommend these. These Bellevilles were recommended to me by some coworkers. I'm a sergeant in the LAPD and I go thorough a lot of boots. I've worn 5.11s and Blackhawks in the past but these Bellevilles were definitely a level up. Not as light as the boots I used to wear but after you lace them up for the first time, you'll know right away these boots are meant for tough jobs. Comfortable as my tennis shoes and my feet havent gotten wet yet with the gore tex. I'd buy again. I've been wearing Belleville 700s since they were issued to me in USAF basic training. I never really took care of them besides slapping some polish on from time to time so they look pretty rough. Fast forward 6 years later and I'm still wearing them. They are solid and never gave me any problems. I just wear em with jeans and call em my stomping boots. I'm looking for another pair to replace these and i'm amazed they still sell them after all these years. That definitely says something about these boots. Even the sole pattern is intact after all these years. Awesome boots for work. Good, solid boots that make your feet feel secure. Speed laces are a plus. Once I took these out of the box, I could tell right away that these are no nonsense boots. Solid without being too heavy. Top quality leather and double stitching all over the boot. I bought these for my job at a prison. Clean looking and tough. Not Cheap but Great Boots! These Belleville 700s are technically categorized as flight boots. I'm retired and use them for everyday wear in my workshop and pretty much wear them everywhere I go. They are the most comfortable boots I've owned. You get what you pay for with these. They weren't cheap but I've had them for 2 years now and wanted to pick up another pair. These will definitely outlast 2 pairs of made in china boots so I figure I'm most definitely saving money by buying a good pair of made in America boots like these. Just Make sure you buy a 1/2 size smaller as they do run slightly large. Awesome boots but they did run large so I had to send them back for a 9 when I'm normally a 9.5. It was a pain to have to mail them back but now that I have the right size. I'm very happy with them. Very comfortable and solid. I could tell right when I pulled them out of the box that they are tough durable boots. This is my first pair of Bellevilles and I am definitely happy with these. I work outdoors in the snow and these have been great. The gore-tex does an excellent job of keeping your feet dry when walking through puddles or snow. I've had these since last winter and they still look great. I fly for the USAF and these have been great flight boots. During long flights, my feet tend to get cold and sweaty. However, these boots are insulated very well and are comfortable and warm. Definitely worth the money!